Lumbar Corpectomy: removal of vertebral bone and intervertebral disc material in low back, along with a fusion. What is Lumbar Corpectomy and Fusion? Lumbar Corpectomy and Fusion is a surgical procedure that is performed to alleviate the pain caused by damaged vertebrae or disc material that pinches and blocks the nerve roots. This surgery involves the removal of diseased bone or damaged discs, followed with the fusion of affected vertebrae to restore spinal stability. Who needs Lumbar Corpectomy and Fusion? Lumbar Corpectomy and Fusion is suggested for patients who have diseased or damaged vertebrae in the lower spine, such as from a spinal fracture, tumor, or infection. The diseased or damaged vertebra pinches and blocks the nerve root, which in turn causes pain in lower spine. This surgery also corrects any deformities in the spinal column. What are the steps involved in Lumbar Corpectomy and Fusion? Following are the general steps involved in the procedure for Lumbar Corpectomy and Fusion. The patient is given general anesthesia. The surgeon makes an incision in the left side of the patient to gain access to the spinal column. The surgeon removes the discs above and below the diseased or damaged vertebrae. Any fragments of damaged vertebra are also removed. The surgeon clears the bone surface and prepares it for receiving the bone graft. The surgeon inserts bolts in the upper and lower vertebrae. With the help of these bolts and other surgical instruments, the vertebral space is opened and the curvature of the spinal cord is corrected. Once the space is open, the bone graft or substitute of bone graft is implanted in the space. 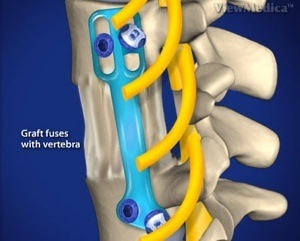 The vertebral space is then closed to hold the bone graft firmly in its place. A metal plate known as Zplate is put between the upper and lower vertebrae. This plate bridges the upper and lower vertebrae. Screws and nuts are added to keep the Zplate in its right place. The procedure ends when the surgeon closes the incision with the help of stitches. The wound is cleaned and a medical bandage is applied over it.During the process of healing, the bone graft will knit with the upper and lower vertebrae to form a single solid bone fragment called a fusion. What happens after Lumbar Corpectomy and Fusion? Most patients are able to go to their homes within four to seven days after the surgery. Physical therapists and occupational therapists will give instructions about walking independently and the proper techniques of getting in and out of bed. The patient is instructed to avoid lifting weight, bending at the waist, and twisting in the early postoperative days to avoid a strain injury.